Wow...the week is almost over! Can you believe it? Where did it go? Hello All! Yes You! Hello! I haven't been very present in Blog Land this week. I have no idea where the days are going. Do you? This weekend we are getting ready to re-do the boys' den. It's the last of the water damage that needs some attention. I'll show you why I've been soooo busy! We all need TEAMWORK to get this done! well I guess I need to find a horse and a goat! Whatever it takes to get it done...HA! Thanks for stopping by and checking in on me! Projects do consume a large portion of our time. I am looking forward to seeing your completed project. Have fun! Amy, here's hoping that many hands make the job go fast and easy! Looking forward to seeing the end result. Teamwork is wonderful and special when families join together to help get jobs done. It seems that spring is full of projects that have been waiting all winter. I hope your day is lovely and full of productivity! Hello Amy~~I happened upon your lovely place here through my dear Stephanie's blog, so happy that I did. You have a beautiful blog and I look forward to following along with you. Enjoy your weekend as you accomplish great things. Funny picture! I haven't been around much recently either. Life will slow down again soon. Have a great rest of the week! I've been very busy too, and I too have wondered where time seems to go, especially in the spring, lol! So many things to do... will look forward to your reveal of the project you have been busy at! 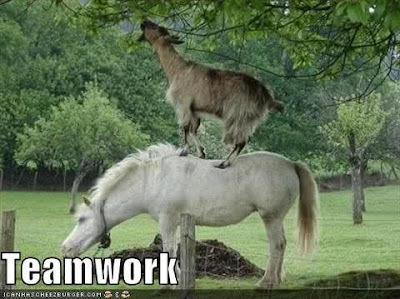 I agree that team work certainly makes a difficult project much easier to handle! Your comment about a horse and a goat was funny, lol! Have a blessed week Amy!